Welcome to our Culture Campaign! We launched this very recently and already this is setting us on an exciting path which we think will revolutionise our brand from the inside out. This amazing campaign has been many months in the planning and making and we feel very proud to be communicating our important messages to every member of staff in our company – that’s a lot of people – 105 franchisees, 29 head office staff and more than 4,500 operational staff! becoming the go-to care provider of choice and the company where people want to work. We feel this sets us apart as an innovative, forward thinking organisation, placing great emphasis on its internal culture and the wellbeing of its staff. It was encouraging too, to see how pleased and interested our care workers were to be part of the process and with the idea of being part of a bigger brand and a bigger family. It is all about enabling our amazing care staff to understand and embrace the brand values, to experience greater job satisfaction and less stress, to feel proud of the uniform they wear, to thrive and feel happy doing the job they do. If we want to become the best brand in the home care business we cannot do this in isolation. We need to work together, each person committed to supporting the other and working for excellence. Creating the mark of excellent care becomes a reality when we all engage, set off from the same place having the same vision, working as one team, with one goal. It begins and ends with each of us, but more importantly, our hard-working care staff. 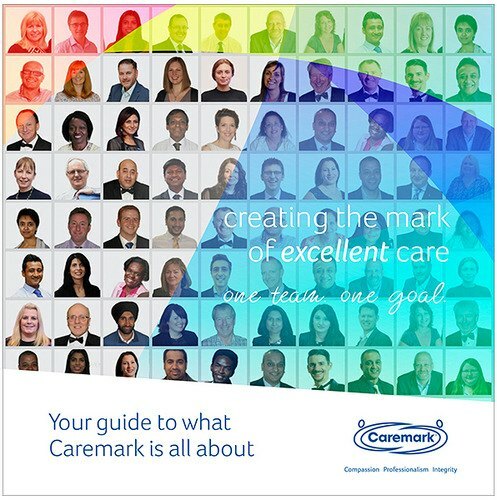 We want each and every member of staff to be proud of Caremark and our brand and feel happy and excited to be part of one large and dynamic team of people, delivering the best quality care across the UK. We believe that if our care workers feel at home and valued in our amazing Caremark family, they will want to stay and encourage others to join. So, we feel our campaign will help each one of us to focus on the important things – to work with compassion, professionalism and integrity – no matter where we sit within the company. If we respect, trust and care for each other we will truly be working as one team with one goal. That way we will be a brand which leads and inspires others follow, and indeed, a powerful force of good for those we serve, as we work each day creating the mark of excellent care.